In August 2017, the traffic of Viva Autobus grew by 18%, compared to the same month of the previous year, to more than 800 thousand customers. 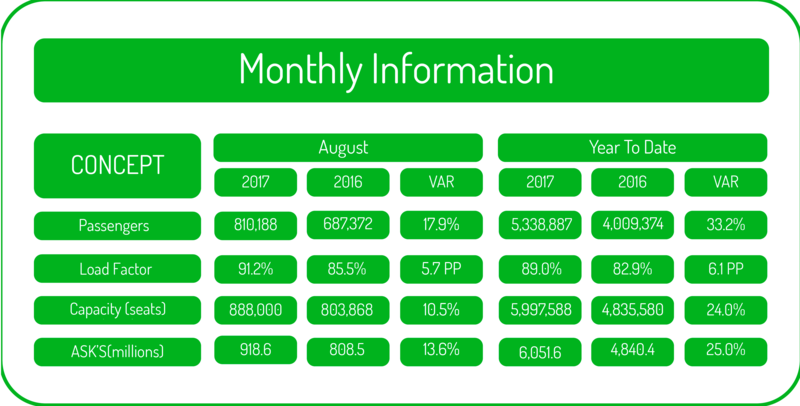 The load factor reached 91% in August 2017, an increase of 5.7 percentage points compared to August of the previous year. Viva Aerobus increased its capacity, measured in available seats, by 10% com-pared to the month period in 2016. So far in 2017, the traffic of Viva Aerobus increased by 33%, compared to the pe-riod January-August 2016, to more than 5.3 million passengers and with an ac-cumulated load factor of 89%.